Watch toddlers and preschoolers develop and grow with Kaplan's selection of comprehensive resource sets. 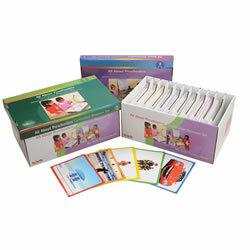 These research based materials provide an extensive curriculum set for young learners. 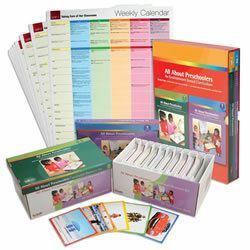 Kaplan also offers developmental posters and book sets to complement the All About Preschoolers curriculum. 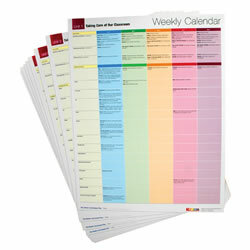 Poster-sized versions for classroom display of the eighteen weekly lesson plans from the All About Preschoolers curriculum. Complete with plans for activities divided into large and small groups and interest areas. Each poster illustrates a daily plan for each week, providing ideas for curriculum areas or centers including group time, art, music, blocks,science, math, and writing. Posters measure 17" x 22". Grounded in solid research, that supports high ratings on quality environment rating tools. This comprehensive thematic curriculum from the developers of the ECERS-R™ is complete with a two volume teacher's guide, weekly posters and resource manipulative set. Teachers are given specific guidance on how to set up, manage and individualize their classroom environment within 18 thought provoking engaging thematic units. Used as a stand-alone or a supplemental curriculum for preschool age children. 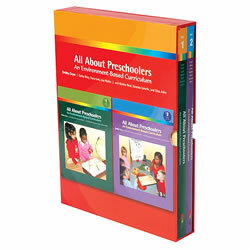 There are 18 book sets which are available to support each unit in the All About Preschoolers Curriculum. 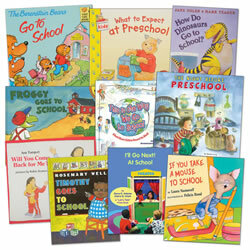 There are 10 books in each set, of various assorted bindings: board books, paperbacks, and hardbacks.